PC Tutoring Services is dedicated to delivering just-in-time solutions and knowledge to help you be more productive and profitable whether you are a business or individual. We supplement our classes and presentations on computer training with one-on-one tutoring. When not sure what program is best for you, or you need a special solution set up, use our consulting service. 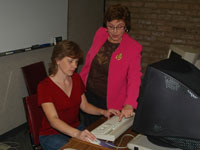 One-on-one can help get a beginning computer user comfortable with working on the computer. Having someone to guide them and help them understand the terminology in the context they want to use the computer. Or a user can get specific help on how to do a more complicated procedure, like master a merge or do Excel functions or charts. Classes provide step-by-step hands-on learning, for those who need to have a structured method of learning. Our classes cover selected features that seem to be the most useful for everyone. Demomercials stretch an audiences’ possibilities. By showing features and explaining how they can help improve productivity, audiences get good ideas that can help them use computers more effectively, while getting entertained. Consulting covers those situations where what is needed is a one-time setup; or advice about the best way to proceed, we offer that. For instance, should you use Excel or Access or some specialized data base program? Or once a complicated Excel sheet is set up for you, you will then be able to maintain it.